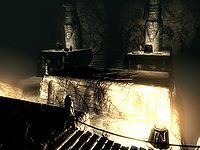 The Twilight Sepulcher is the location of the Pilgrim's Path and main entrance to Nocturnal's Ebonmere portal, resting place for the Skeleton Key. It contains two zones: Twilight Sepulcher and Twilight Sepulcher Inner Sanctum. It is found to the west of Falkreath, due south of Knifepoint Ridge. The clearing in front of the entrance, which consists of an iron door is strangely devoid of harvestable vegetation. There are the remains of a number of stone pillars, that imply the approach was previously far grander than it is now. There is a vacant beehive containing a bee and a sample of beehive to the right of the entrance. A waterfall to the left forms a brook across the path before joining a pond on the right. 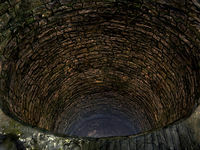 You enter into a well lit narrow tunnel that opens into a large cavern after a couple of turns. In front of you is a wide flight of stairs leading up to a large door. On your first visit a ghostly body that turns out to be a Nightingale Sentinel who is known to you, will be standing in front of the stairs. Conversing with the sentinel provides his name but no info about what you will face along the Pilgrim's Path. There is a double row of broken pillars leading to the stairs and large rock pillars supporting the ceiling around the cavern. The cavern is dry and lit by braziers and candles on stands line the stairs. 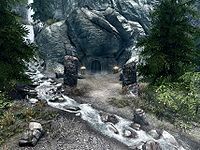 The only other items of interest are against the east wall level with the stone pillars in front of the stairs, the sentinel will direct you to them if you converse with him and consist of the skeletal remains of Nystrom, his satchel and a leveled enchanted weapon. Searching Nystrom's skeleton will reveal his journal, which will provide clues about the upcoming tests found along the Pilgrim's Path. At the top of the stairs is a large corridor heading south, this is the start of the Pilgrim's Path. Just before the corridor turns to the west there is a bowl of troll fat and a skeever tail (see bugs) on the ground, on your right. At the end of the corridor is an unlocked iron door. It opens into a room with stairs leading down past terraces containing stone benches in front of you and a walkway around the edge. There is a Nightingale Sentinel at the bottom of the stairs and another in a room in the southwestern corner. 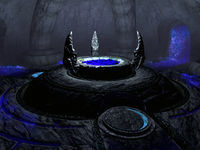 The room consists of a stone table holding a random filled soul gem, a salt pile and a copy of 2920, Evening Star, v12. Behind the table is a chair, two barrels of foodstuffs, a fireplace and a button that activates a hidden door on the south wall. There is an alchemy lab to the left of the fireplace and a set of shelves opposite. The shelves hold a sheaf of wheat, a bulb of garlic, a silver ingot, and three common books. Behind the hidden door is an alcove housing a set of shelves. They hold a knapsack, two bottles of wine, one of alto wine, one of Nord mead, a leveled potion of regeneration, a leveled potion of healing, magicka or stamina and an unlocked chest. To the north are two arches that lead to an area with two more sets of shelves holding eighteen common books, a copy of Shezarr and the Divines, a steel dagger, a flute, a sprig of snowberries, a bowl of bone meal, a potion of cure disease, two bottles of wine, a bowl of void salts, a random potion of invisibility, a random potion of pickpocketing, two random poisons and a sack of foodstuffs. At the bottom of the stairs is a pulpit with stairs up the back and behind this is a doorway into a corridor, after a couple of paces it turns first to the south, then back to the west. Just after the second turn there is a pressure plate that triggers a poison dart trap that shoots darts from either side of a doorway in front of you. 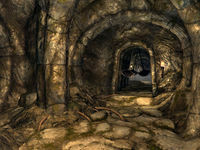 Past the doorway you enter a typical Nord catacomb area with a Nightingale Sentinel at the top of a flight of stairs. There are alcoves along the sides for coffins and bodies and an unlocked iron door at the far end. Through this door is the second of the five tests. It appears to be a large space with brightly lit parts with a shadowy path running through them. There are several flights of stairs up and down to and from raised platforms. The light is deadly and will drain health at an alarming rate. (Not even Become Ethereal will prevent the HP loss.) Stick to the shadows to navigate safely. There are also four tripwires, all of which trigger poison dart traps. There are bodies of bandits in the first couple of patches of light and hanging mosses growing from the corners and edges of some of the platforms, most of these are in lit areas. The first tripwire is found about halfway up the first flight of stairs. The poisoned darts are shot from in front of you and will only hit you if you continue to climb the stairs before they finish firing. The second tripwire is at the top of the next flight of stairs down and shot from your left, again the easiest way to avoid damage is to stand still until they finish. Continue to follow the path by sticking to the shadows until you reach a flight of wooden stairs leading up to a wooden bridge. The third tripwire is at the start of the bridge and the easiest way to avoid damage is to move to your left or right until they finish firing. There are two narrow flights of wooden stairs leading up to a higher platform with a gap between them where the last set of darts were firing from. At the top the path turns to the right and descends another flight of stairs trapped with a tripwire at the top, again wait until they have stopped shooting from in front of you to avoid damage. If instead of turning right you cross a brightly lit area, passing a brazier to another dark area at the far end. 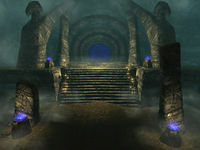 There are stone stairs leading down to a platform near the start with two large urns with the normal random content. You can either then pass back across the lit section or follow the shadowed path again. From here follow the shadowed path up a wide flight of stairs to an iron door. Beyond the door are catacombs, the path heads south before turning to the west, at the corner there is an urn in an alcove and at the next turning, to the south again there is an unlocked chest. In front of you is a statue of Nocturnal herself with a dead bandit lying in front of her beside a wooden plate holding a random empty soul gem, a soul gem fragment and eight loose coins. Behind the stone braziers on either side are two chains; pulling both of these opens a hidden door behind her statue. Through the door is a tunnel that twists before opening into a corridor. Part way along this there is a pressure plate that triggers a poison dart trap to shoot from the ceiling behind you. As you get close a swinging blades trap will trigger in the corridor ahead. There is also another pressure plate halfway along the corridor with the swinging blades that triggers the poison dart trap a second time, at the far end of the swinging blades trap there is a third pressure plate that triggers a spear trap, the spears come from all sides. Beyond this is an iron door, opening and/or closing this triggers a battering ram trap in the corridor beyond. There is an alternative route, when you reach the first pressure plate there is a master-locked iron door on your left that leads to a room with two Nightingale Sentinels. You enter in a walkway along the northern edge of a room with a sunken center and a walkway around three sides. The walkway runs parallel to the heavily trapped corridor. At the end there is a doorway into a corridor still heading west, after a few paces there is a junction to the south, straight on leads to a room that rejoins the path from the other trapped corridor. Turning south leads past a small balcony overlooking the sunken part of the room to the north, where one of the two sentinels are standing, if they haven't been alerted to you. The corridor continues to a matching doorway onto another walkway on the south side of the room. This doorway is where the second sentinel is standing unless alerted. At the rear of this walkway there is a doorless square cage and also wooden stairs down to the sunken portion of the room. At the bottom of the stairs there is a sideboard against the south wall holding three common books a random dagger and a ruby. Against the west wall is a statue surrounded by two levels of water, there are two shrine bases in front of this, one holds a random poison and the other a small coin purse. Against the north wall is another sideboard with three loose coins next to a goblet, with a broken table in front of it, on this table may be a copy of the Sneak skill book Sacred Witness (see bugs). To the right of the sideboard is a bookcase holding seven common books, a bowl of frost salts and a sack of foodstuffs. To the right again is a set of shelves hold a couple of pieces of firewood and along the east wall is yet another set of shelves holding three bottles of Nord mead, two of alto wine and two of wine. In front of these shelves are two stone tables one holds three random poisons and the other a random bow and a copy of the Lockpicking skill book Proper Lock Design. In the southeast corner there is a random poison on a barrel. From the room where the two paths rejoin there is an iron door that leads to the Twilight Sepulcher Inner Sanctum. Through the door is a wide corridor, similar to the ones seen when approaching puzzle doors. At the far end of the misty corridor are large double iron doors, with a flight of stairs leading down. From there the corridor turns to the east and through another doorway is a shaft that you are required to jump down. You will receive a small amount of damage from the fall. Once at the bottom search Anders skeleton. He carries a note that explains what happened to Nystrom and himself. Shortly after this a cutscene will start and the floor will lower to reveal a circular room with a hole in the center for the Skeleton key to unlock Ebonmere and three doors that you can't interact with spaced equally around the wall. The doors become portals to the entrance upon completion of the quest. You can return here any time you like to change your agency of Nocturnal from a portal in Nightingale Hall. On your arrival back to the entry cavern where you first met Gallus, the braziers are now all lit by blue flames. You have to wait a full day after changing your agency before you are able to change again. 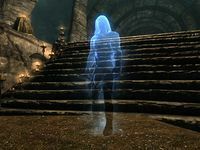 The Nightingale Sentinels are not considered undead in the game data, so they are not detectable with the Detect Dead spell, but rather with Detect Life. The Sacred Witness skill book may not be present. Beside the bowl of troll fat, there appears to be other items, including a skeever tail that are glitched into the floor, that you cannot interact with. ?